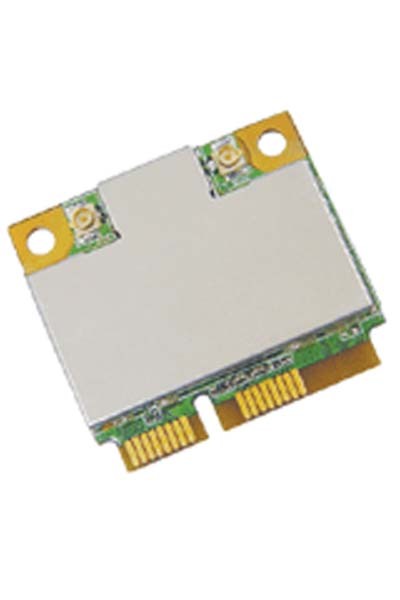 The Azurewave AW-NE195H is a PCI Express half size Mini-Card wireless module. It is a highly integrated wireless local area network (WLAN) solution to let users enjoy the digital content through the latest wireless technology without using the extra cables and cords. It enables a high performance, cost effective, low power, compact solution that easily fits onto one side of a PCIE half size Mini-Card. Compliant with the IEEE 802.11b/g/n standard, the AW-NE195H uses Direct Sequence Spread Spectrum (DSSS), Orthogonal Frequency Division Multiplexing (OFDM), BPSK, QPSK, CCK and QAM baseband modulation technologies. A high level of integration and full implementation of the power management functions specified in the IEEE 802.11 standard minimize system power requirements by using AW-NE195H. Compared to 802.11g technology, 802.11n draft 2.0 standard makes a big improvement on speed and range. It Increases the wireless range by up to 2 times and reduces dead spots in coverage areas. The robust signal travels farther, maintaining wireless connections farther than the standard 802.11g. The data rate can go up to 150Mbps.